If you love shapes and figures, then this is the right chapter for you. However, if you are one of those who do not like to look at figures and shapes then this lesson will certainly change your mind. Geometry is all about shapes, sizes and figures. It concerns measurement of area, perimeters and volumes of a certain shape or figure. So, basically everything in this chapter would tackle about the subjects mentioned above. Area is defined as any part of a space. Solving the area of any shape or figure varies since each shape has its own formula. The unit used to express this measurement is showed in squared form. For example, cm2, m2, km2. Moreover, only units of length can be used to express this measurement. Perimeter is the measurement around the shape or object. 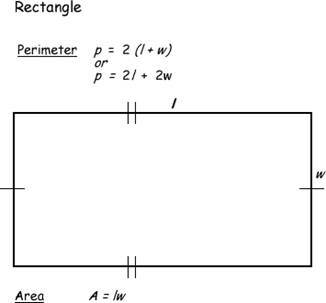 Just like solving for the area, solving for the perimeter of a certain shape or object varies. This measurement also uses the units of length. However, the measurement would follow the unit of the sides of the shape or object. For example, m, cm, km. Volume is a measurement expressed by the space an object occupies. The units used for this expression are also the units of length. However, the resulting unit would be cubed. For example cm3, m3, km3. A square is a figure that has four equal sides. The formula above only implies that we square one side of the square since all its sides are equal. The formula above means that we can solve for the perimeter of the square by multiplying one side with four. 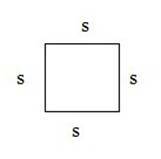 Since a square has four equal sides. A rectangle has 2 equal sides. So we just multiply the values of length and width. The formula means that we have to multiply each equal side with 2 and add the resulting measurements.